Today I'm drinking Stoudt's Winter Ale 2010 brewed by Stoudt's Brewing Company in Adamstown, Pennsylvania. If you click that link you will see a picture of the bottle I'm drinking; however, all of the apparent categories like "hops" and "malts" and "food pairings" seem to be empty or not links. Either that or I'm not smart enough to navigate their website! 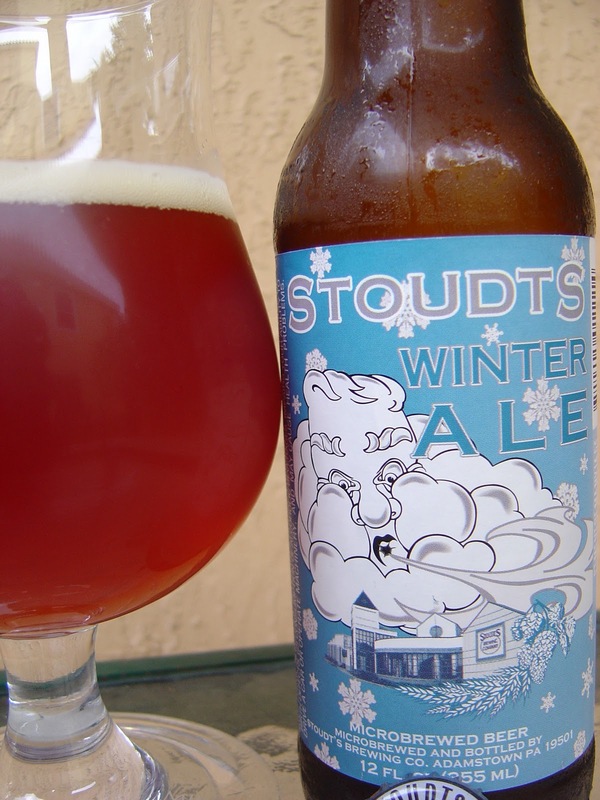 The label depicts an Old Man Winter type cloud blowing wind on the Stoudt's lodge. One thing that I did learn is that they change the style of their winter ales every other year, but I'll be damned if they said what style belongs to this one. AND I'm making a great leap of faith that this is the 2010 version as the faintest smudge on the bottle neck may say BEST BY 5/27/2011, but I'd need access to an FBI lab to confirm. Now I don't usually talk that much about (beer) head, but since I was over looking at the picture on the brewery's website, I will comment that I got nothing even close to that. My photo is accurate. Bready malt with a little orange citrus aroma, and slightly spicy. Nice malty bread beginning with a big bitter spicy black pepper behind it. So this is a Double IPA right? Dunno. I'm sure some of you smarties will probably do more research and tell me. Citrus orange sweet; pine tree bitter answer. Some alcohol adds a little warmth and a dry finish, and bitter is left behind on the palate. Very cleansing. Good carbonation, too. Solid. I liked it. Check it out!